Green Light actions are always a good idea. 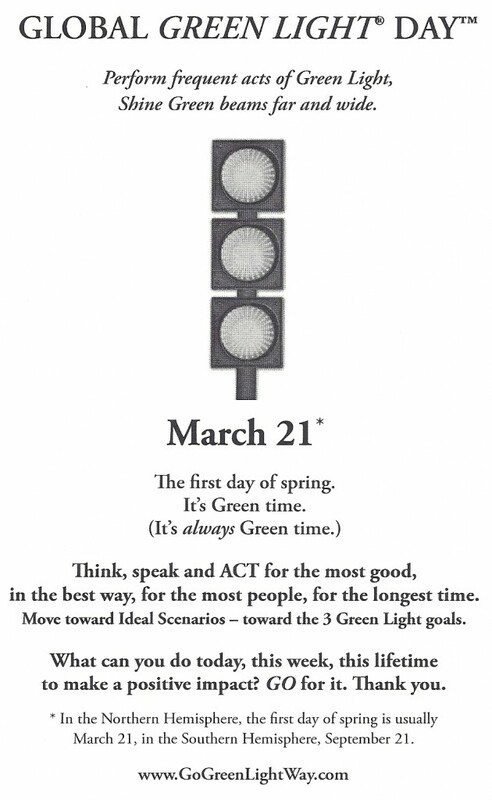 Celebrate with your Greenest spirit on March 21, Global Green Light Day™ (GGLD.) The usual first day of Spring, it is an ideal date for painting a piece of the globe Green! (In the Southern Hemisphere, it’s September 21.) This is the time for us to rally round the planet and Green it up – every way possible. Spread Green Light thoughts, words, and ACTIONS. Make March 14-21 a Green Light week. St. Patrick’s Day is right in the middle of it, spreading Green big time. Celebrate the day in a bright Green Light Way. Apply an idea from this book. Get ideas from Earth Day, Arbor Day, and other Green kinds of holidays and events. Go to Asknature.org for examples of biomimicry and see wide-ranging innovative Green ideas to adapt from nature. public-service announcements, film storyboards, and do grant proposals for their own not-for-profit organizations. Jane McGonigal, Institute of the Future, Palo Alto, California directs the institute’s game research and development. She says, “Good deeds will become a bigger draw for gamers. Players will undertake missions to help others.” Imagine what games can be created, in a range of forms, for a variety of goals, that promote Green Light actions! Bring ’em forth! cities to isolated rural regions. Founded by Jensine Larson, World Pulse Magazine (semi-annual) and Pulse Wire (www.worldpulse.com), an interactive web community, bring unheard voices and Green Light ideas to the world. Green someone’s day. Who might you thank for a favor, gift, or contribution? Who might you call with an uplifting message? What pocket park, parking lot, roadside area, or sidewalk can you clear of trash or beautify? Who might love an hour of two of help – babysitting, running an errand, bringing a cup of coffee, or just being good company? Gather pieces of Green Light news to share with others. Every Green thought, every Green word and Green action Greens up your day and likely many others’ days as well. Know that you are contributing to a global movement. Recreate yourself in a Green way. Revisit your dreams and take a step in the direction of a favorite one. Take action on a source of suffering in your family, neighborhood, or organization. Communicate your Green Light intentions, words, actions, and meditations. Find Green Light workers in action and commend them; spread the Green news about them. Initiate Green Light conversations. Greenly re-direct a Red Light conversation. Write a compliment or thank you on a business card or note pad and give it to a flight attendant, server, mechanic, or other day-brightener. Send a Green Light message by mail, phone, or email. Inhale gratitude. Exhale regret. Inhale joy. Exhale stress. Spread joy around you. Serve a worthy cause – the environment, social justice, literacy, animal rights, or other concerns. Volunteer. For more ideas, check out ODE Magazine, “YES!” magazine, the Giraffe Project, the Hunger Project, and similar Web sites. Share Green Light ideas and actions at a hospital, school, or retirement center. Collect books for shelters, inmates, and disadvantaged youth. Support Green Light efforts of Chambers of Commerce, government, professional, and civic groups. Play “How Green can you be?” Notice your Green thoughts. Catch the Red ones and switch them to Green. Find a Green Light colleague or playmate and make something Green happen. How many smiles can you generate? How many compliments can you give? On March 21, give the term “Green with envy” a new meaning! Go Green Light. Become unbeatable, unstuckable, unstoppable. GO! ourselves as loving, unlimited creatures of possibility, we experience ourselves as limited, fearful, insecure and unloving. social networks as well. Make a book of the class posters. Keep a copy in the room. Place an extra copy in the library. If the date for Global Green Light Day were May 4, the rallying call might be, “May the forth be with you.” Since it’s not that date, when you wake up on March 21, sound the call, “March forth – and GO Green!” Issue the call each day -and watch your world get Greener. Brain on Green Light: VROOM! Give it a GO! The standard first rule for many groups is “First do no harm.” With Green Light, it is, “First do some good -then do some more.” Extend invitations for folks to put creativity to use – to include it in projects as well as play. As Green Light DO-ers, see how you’d like to turn your creative ideas into reality. Then add the ACTION piece. Do it! Enjoy it. Celebrate it. Spread the Green news. Salutes for your contribution to Global Green Light® Day™ – and for every Green Light act. Perform frequent acts of Green Light, Shine Green beams far and wide. Think, speak and ACT for the most good, in the best way, for the most people, for the longest time. Move toward Ideal Scenarios – toward the 3 Green Light goals. What can you do today, this week, this lifetime to make a positive impact? GO for it. Thank you. * In the Northern Hemisphere, the first day of spring is usually March 21, in the Southern Hemisphere, September 21.